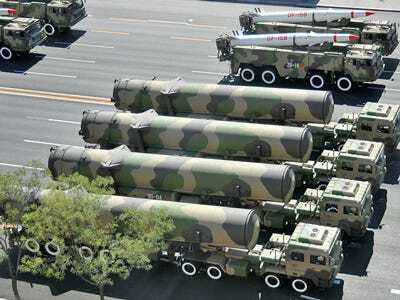 AUS AirpowerA fleet of Chinese road-mobile ICBMs. China is on the cusp of truly ominous nuclear and space warfare gains, the 2014 annual congressional report from the US China Economic and Security Review Commission states. The report warns that China’s nuclear warfare capabilities will rapidly modernise and proliferate. In 2013, the Pentagon estimated that Beijing’s nuclear arsenal was comprised of roughly 50 to 75 nuclear capable intercontinental ballistic missiles (ICBMs) that could reach the US. Within the next 15 years, China will likely have an arsenal of over 100 ICBMs. Essentially, Beijng could soon have the capacity to destroy any US satellite it wishes. This ability to target US satellites would pose a significant threat to the US military, as it would cripple the use of GPS and satellite communication.